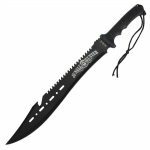 If you are in the market for various types of machetes, then you have likely began to notice how many different types of machetes there are. 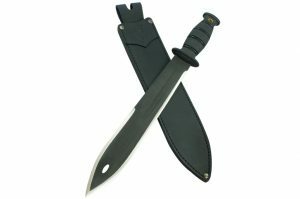 It is important to understand the different types of machetes that are out there, that way you can choose the machete that is right for you. This is because different types of models are used for different situations, from normal cutting and chopping tasks to chopping your way through thick, tough bush. So the first question you have to ask yourself is what will I be using the machete for? 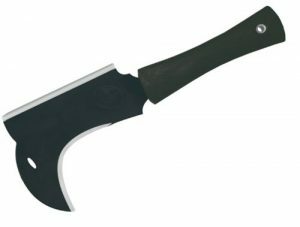 Chopping power – you’ll be mainly using it for chopping small trees or branches, try the kukri, heavy or bolo machete. 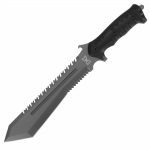 Slashing power – one that you can use all day to get through green vegetation or clearing a camp area, get a parang or a Latin machete. All-rounder, the Bolo or Golok is your best option. Survivalist or camper, you’re best off with a kukri, Bolo or Golok. This is a standard machete, and likely the most common style imagined when machete is mentioned. It is an all-purpose tool and has a straight backed blade which is often evenly weighted and stout. It is used for the usual cutting or chopping needs. A good example of this is the Tramontina Latin machete. This one provides a blade that can do well in all areas. It has enough weight to chop or split wood, the tip is blunt and can be used as a pry bar or digging. The back of the blade can be used for saw, and the flat part as a hammer. Because it was designed for rescue and camping, it is a popular choice. An example is the SOGfari Kukri Machete. These blades have three sections, the thick midsection is used for chopping, the narrow section for carving and a pointed tip. It’s commonly used as a utility tool or chopping medium vegetation. It can be used to slash through light vegetation but it’s primarily a chopper. If you want something to be used to get through lots of light vegetation, you’re best off with a Latin machete or the parang machete. The reason the kukri is so popular is because it can be used to do finer tasks like a big knife can. 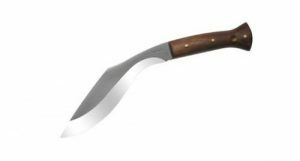 Below is the Ka-Bar Kukri which I have reviewed here. When you need a multi tool, this is the machete for you. It can be used as an axe, a knife, or a machete. Many people consider it as the workhorse of machetes, with a blade that is weighted at the top. The tip is either dull or removed while the flat cutting edge is used for chopping. It is commonly used for splitting wood, chopping tough vegetation or thick brush. A good example is the Cold Steel Heavy Machete. This machete is also a powerhouse, similar to the heavy machete, but with a pointed tip. 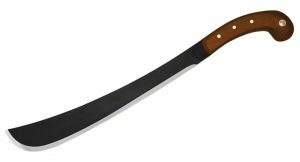 The blade is weighted near the end to provide improved chopping abilities and the blade is usually thicker than the average machete blade. It is commonly used for cutting your way through the toughest terrain. 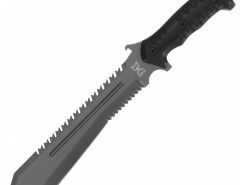 Check out the Gerber Gator Bolo Machete below. 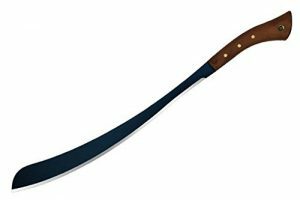 This one is also called the Parang machete and provide a distinctively curved look, with the edge and spine both being curved. The design of the curve helps to concentrate force on a smaller area while preventing the blade from getting lodged within the material. It is commonly used for cutting wood. 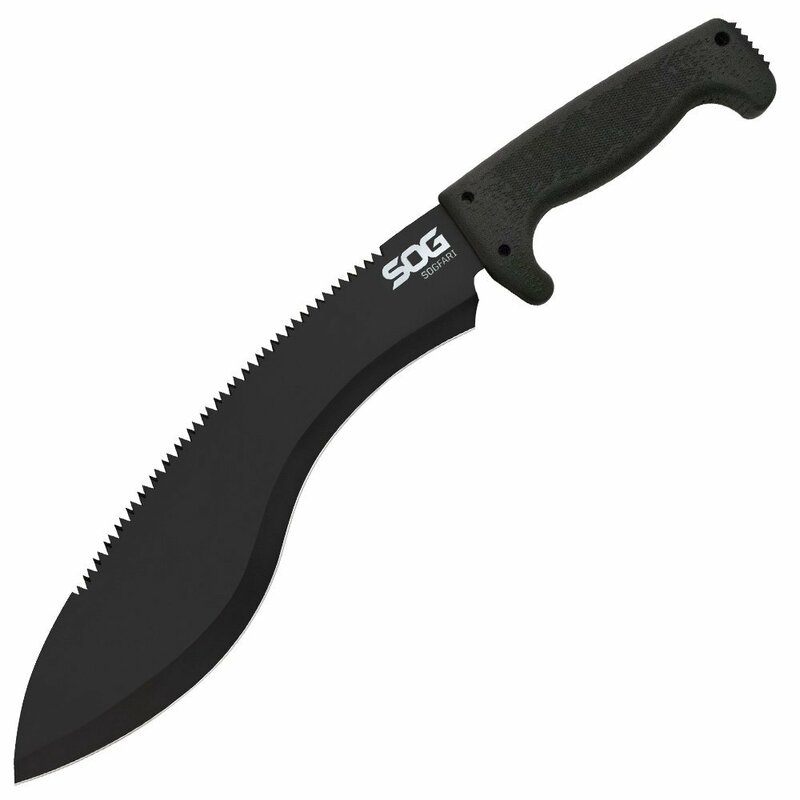 Below is a picture of the Condor Tool and Knife 14-Inch Golok Machete. The Condor Tool and Knife Parang Machete which is pictured below I have reviewed here. This is an ancient tool designed to chop around objects such as vines. It’s a very common tool in agriculture and really popular with homesteaders. Check this page for bill hooks. A combat machete is obviously used in combat. 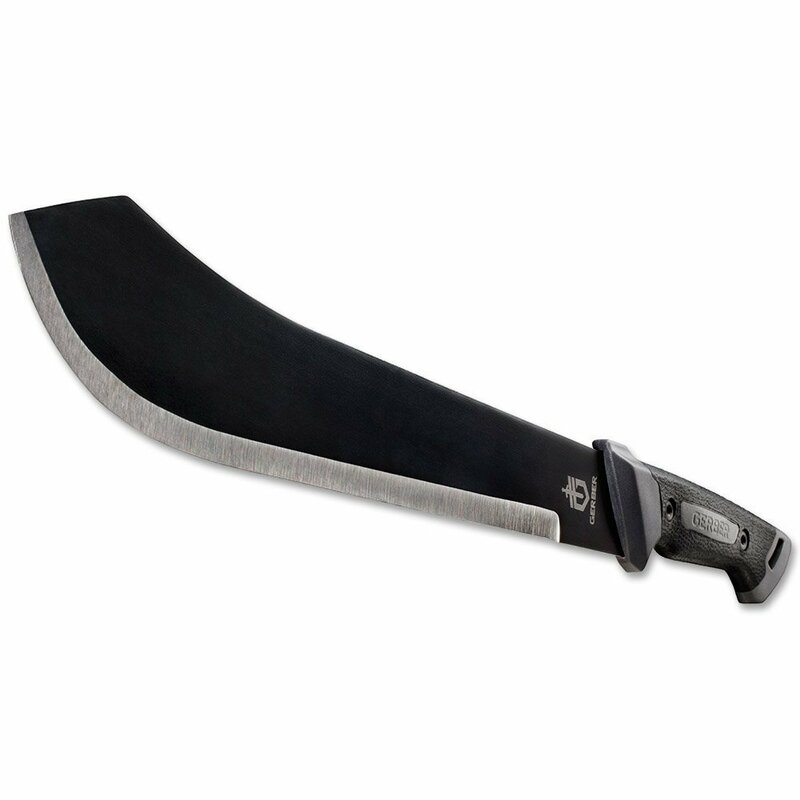 The Gurkha’s have been using machetes in combat for hundreds of years. 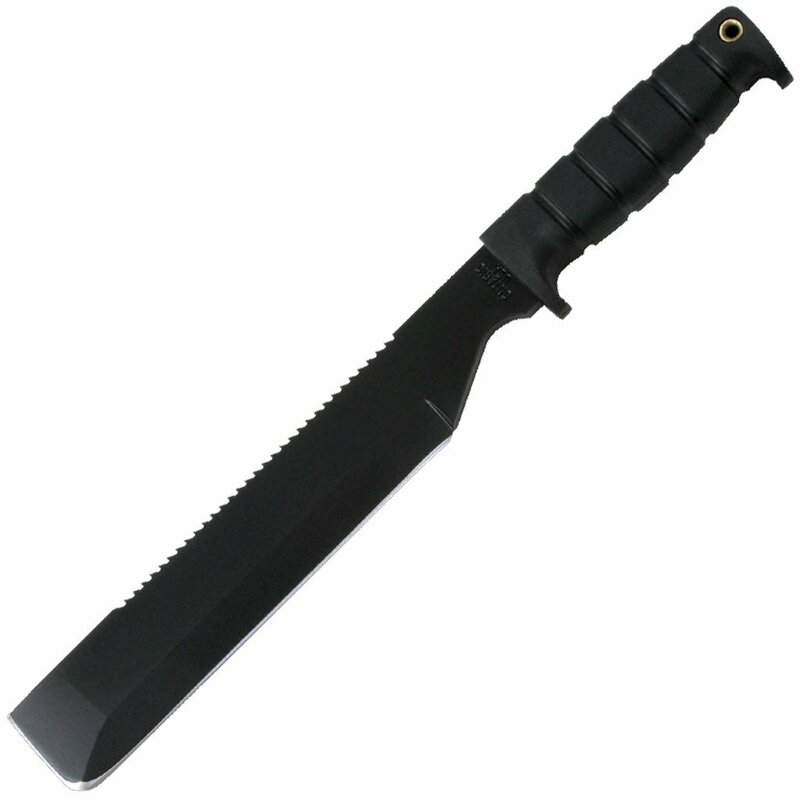 There are several types of combat machetes, some are primarily thrusting machetes and there are others that are slashing machetes. This type of machete will have some type of additional feature which will make it tactical. I’ve got a page of tactical machetes you can check out. These cool machetes are more about looks that function. They can’t chop through wood effectively but they can chop through zombies effectively. The above are just some of the many different types of machete’s that are currently on the market. 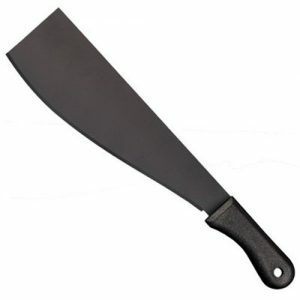 Depending on the purpose and use, one type of machete may be better than another so doing the research is recommended.